This motet, which is a praise to the Virgin Mary ("Blessed art thou, Queen of Heaven") belongs to the most famous choral works from the 14th century. Benedicta es, caelorum regina contains a double cantus firmus (1st and 4th cello) that dates from the 10th century. These voices are composed with a phenomenal polyphonic quality, which is derived from the cantus firmus. It is recommended to duplicate the main voices and place the ensemble in two groups (1st—3rd and 4th—6th cello) facing each other. It is crucial to create a very transparent timbre and a dynamic that follows the energy and movements of the individual voices. 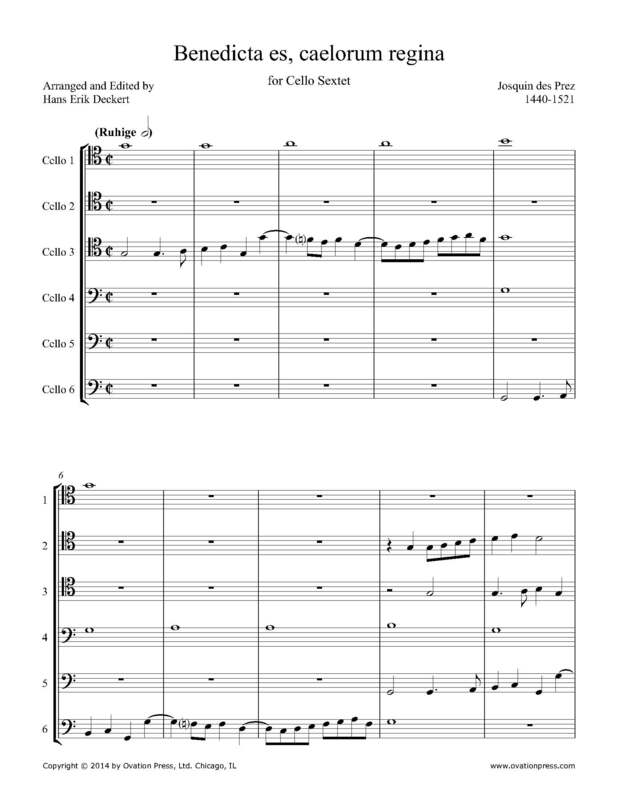 Download and print the score today to gain access to this expertly edited arrangement of Josquin's Benedicta es, caelorum regina for cello sextet by Hans Erik Deckert!